At the entrance of Chora in Andros, laying on the rock, there is the church of Agia Thalassini. According to tradition, Agia Thalassini protects those traveling in the sea, along with Saint Nicholas. Andros is an eminently maritime island, and this is the reason why all residents have the internal need to have an extra uranium bracket: when men, brothers and fathers are traveling in rough seas! Usually Agia Thalassini wears a red chiton outside, indicating her human nature and a blue or dark green inside,which testifies her direct correlation with the birth of Christ. Chora in Andros is located in the eastern part of the island and it stands out for its beauty, glamor and magnificence. Cobbled streets and picturesque alleys, neoclassical houses and mansions, beautiful churches and museums compose the image of the Lady of the Sea. At the rock at the entrance of the harbor you will find the lighthouse Tourlitis. A little further northeast at the end of the famous maritime state, on an island, a few remains are kept from the Lower Castle, built by the Franks in the early 13th century. An arched stone bridge connects the island of the Lower Castle with the housing estate of Chora. The village is joined to the island with a stone vaulted arch. The ravine of Pythara is located in the village Apikia within ten minutes of the way through a smooth path full of vegetation. The area is called, according to tradition,”Neraidotopos”, which prepares travelers for the beauty they will face. Flowing, crystal clear waters create a superb habitat in the green landscape forming waterfalls and lakes. At these locations, aquatic life is abundant . The sources of the waters are in Mount Petal, in the area of Eurousies, and the estuaries is Gialia beach. You will be enchanted by the lush greenery, the rare species of plants and wild flowers and the many different species of birds. Andros is the second largest island of the Cyclades with 176 km. total coastline. Guests can therefore find many sandy beaches according to their tastes. Some of the beaches have easy access, while others are accessible only by sea. Many are organized with sunbeds, umbrellas and a beach bar while others are more secluded. Some of the most popular, which are close to our facilities, are the beaches of Agios Petros, Batsi and Golden beach. In the organized beaches, you can find water sports, diving schools and many other activities. The world famous Basil and Elise Goulandris’ Museum of Contemporary Art in Andros opened in 1979 and since then it has been enriched with important works from the personal collection of the couple. Every year the museum hosts unique painting and sculpture exhibitions. The present merges with the past, creating a space that is an inspiration to those who visit it. The Tower of St. Peter in Andros is one of the best preserved in Cyclades . It’s located on a hill overlooking the gulf of Gavrio and has a cylindrical shape. As we conclude from the area of the construction and the shape of the tower, it was built for the surveillance of sea lanes. People wanted to have the control of the sea around the island of Andros, so that they and their villages would protect themselves from the invading enemy or an attack by pirates. On the island of Andros you can visit significant monasteries dating from the Byzantine period to the last years of the Ottoman Empire. Some of them have been recently renovated. All of them are of exceptional interest, as they preserve important relics. For example the Panachrantou Monastery which is located on the slope of Mount Gerakones and is the most beautiful Byzantine monastery of Andros. You can also visit the monastery of Zoodochos Pigi, between Gavrio and Batsi, and Agia Marina’s monastery in Apikia region. The island of Andros offers a vast variety of activities to the visitors of all ages. Many of the organized beaches in Andros offer facilities for water sports and diving schools. This also includes the beach of St. Peter, which is near our facilities. You can discover the beauty of the island by choosing one of the many hiking trails or take part in one of the daily excursions that are being organized. With it’s total area of 383 km2, Andros is after Naxos the second biggest cycladic Island. The incomparable beauty of Andros makes it stand from the other islands of the Cyclades and the Aegean. According to the famous poet Andreas Embirikos, “Andros is the most beautiful island in the world, the queen of the Aegean Sea”. 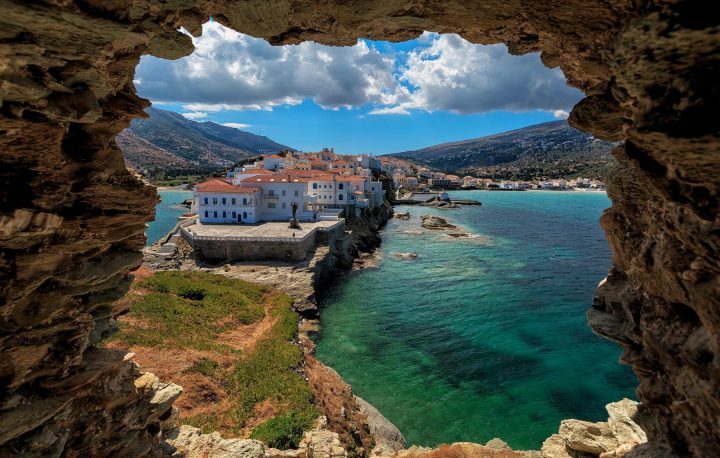 Andros is a beautiful island located in the Aegean Sea. The crystal clear mountain streams that rush down the hills and the marvelous beaches, well known for their deep blue waters do make this island an ideal destination for your vacations. 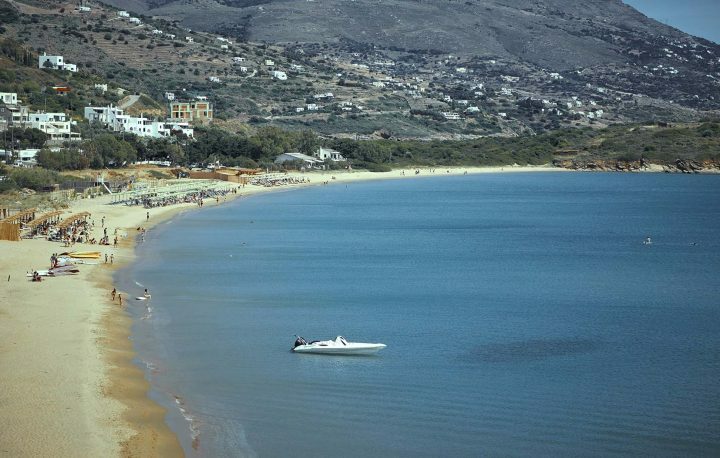 Andros is located two hours from Athens and from our facilities you can easily reach the beautiful beaches of St Peter, Mpatsi and Chrissi Ammos as well as many others. This position makes it an ideal choice for summer holidays and weekend getaways. 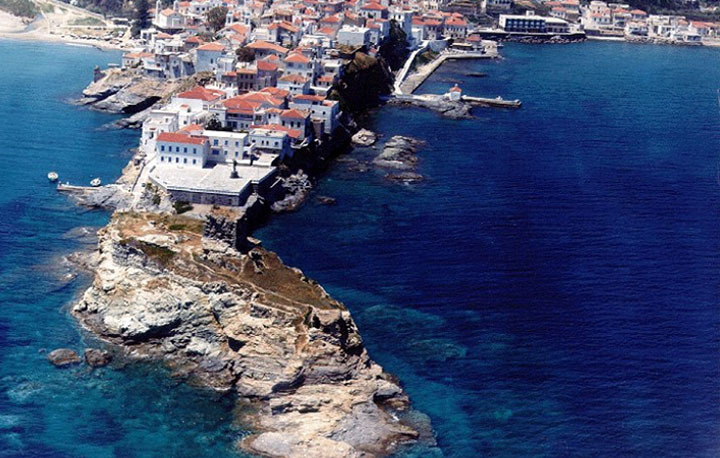 Due to its short distance from Athens and its diversity, Andros is ideal for all travellers. In this island you will relax and have fun. You will taste traditional dishes as well as the modern cuisine. You will swim in beautiful beaches but you will also discover the spiritual side of the island in the monasteries and churches. Don’t miss the chance to stay close to the endless nature and its trails. Andros is a miniature of Greece. It has countless magnificent beaches, many ravines, small rivers, high mountains, hot springs, olive trees, oaks, fruit trees, cypresses and streams. The island has rich geographical contrasts and combines the dry Cycladic landscape with the lush vegetation and abundant water. Choose Studio Irene for your stay in Andros. Enjoy a unique holiday experience in St. Peter, two minutes walk from the beach.